One issue that many equatorial mounts have is what to do when you reach the meridian, the north/south line across the sky. 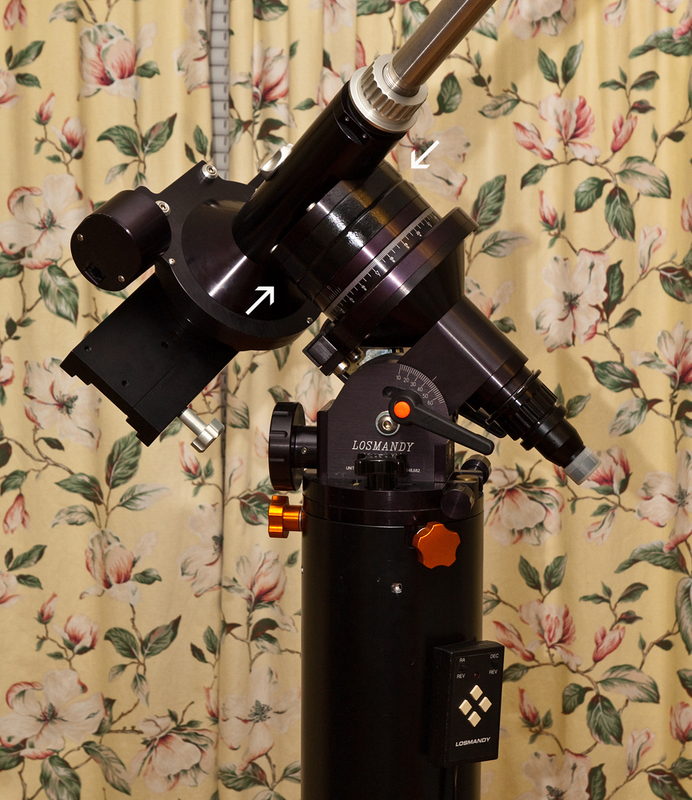 Typically, the mount will no longer track once the counterweight bar goes much above horizontal and the scope goes below. You need to re-position the scope and mount right when your target is highest in the sky. The G-11 has this problem, too; at least on one side. The RA motor gets in the way. A way around it is to place a spacer on the RA axis. The mount can then pass right through the meridian. I’ve read that Losmandy used to sell a two-inch aluminum spacer, but they no longer do. There’s someone in Europe who sells one, but it costs several hundred dollars. I made this 1-½ inch spacer for under $20. (It would have been more if I had had to pay for the paint and polyurethane finish). 1-½ inches is enough room for the stepper motor on my Digital Drive G-11. I don’t know what the Gemini motors would need. Some research I did showed that some folks have concerns that these spacers my cause stress and strain on the needle bearings in the mount, but others said they had not had issues. But it’s something to keep in mind. I made this, but the idea isn’t mine. I had seen the expensive aluminum spacer, and was looking for alternatives and came on this thread on Cloudynights.com. If you scroll down a bit, you’ll see a post by ‘averen’. I wrote to him, and he gave me some pointers on how he built his. I copied some of his ideas, but used my own, too. I bought my MDF at Home Depot. MDF is a good material for the spacer because it comes very flat and is made to handle compression. The smallest piece I could get was 2 feet x 4 feet. The only bolts I could find at my hardware store were 2-½ inches long, so I had to cut a bit off with a hack saw. You don’t want to use a water-based paint on bare MDF because it will swell up and the surface will get very rough (so, useless for this purpose). 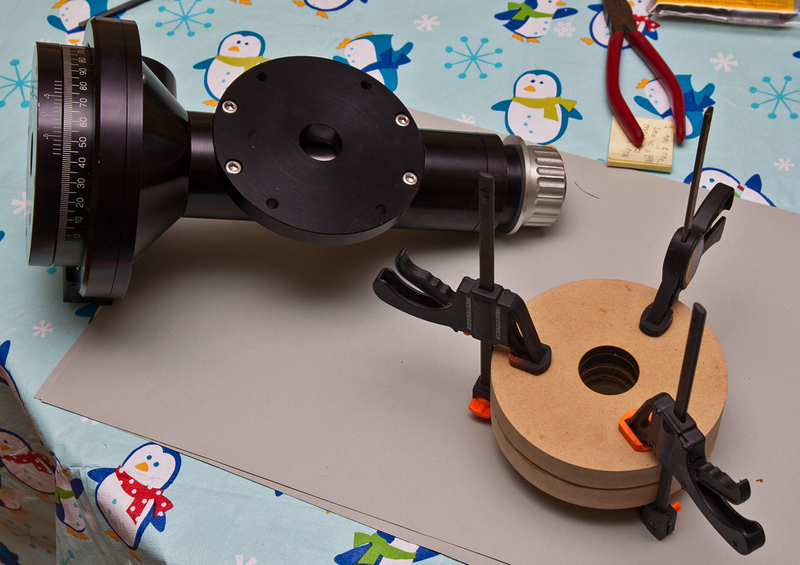 A router and a drill press, clamps, and some kind of saw. A router is the best way to make smooth, accurate circles in wood (or MDF), and a drill press is needed to make the precisely straight holes through the spacer that will be needed to attach it between the two metal plates on the mount. 1. Making the circles: I cut square pieces out of the MDF, a bit larger than the 5-inch circles I wanted. I then found the middle of each square and drilled a ¼- inch hole through it. I carefully measured from the center of this hole to a distance of 2-½ inches, and marked this as the edge of the circle. I then drilled a 3/8th-inch hole outside of that mark. The center hole was for the post of my circle-cutting ‘jig’, and the bigger hole for the bit on my router. I have an old work table that I mount my router under, and when making small circles, I just line the two holes up and screw the jig to the table. Two circles are needed for the spacer. After making them, I sanded the edges (leave the top and bottom alone!) very lightly with 320 grit sandpaper. 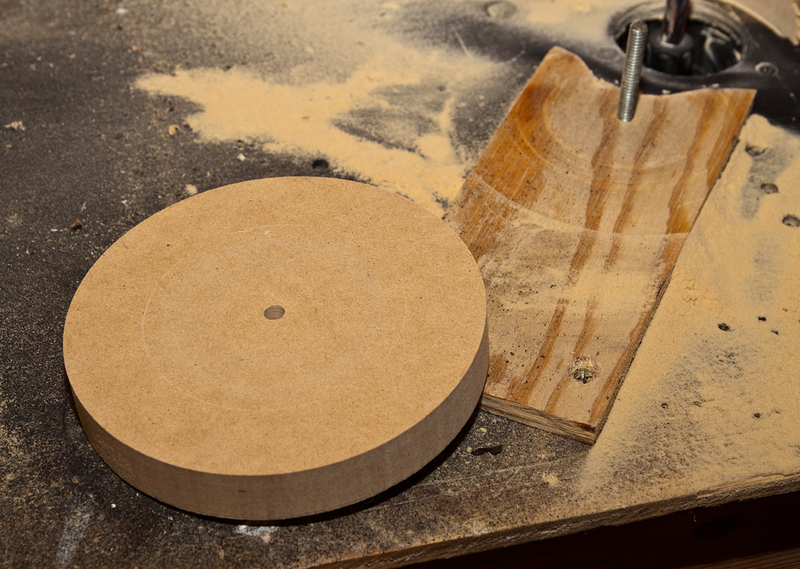 One MDF square, with holes drilled for matching up the jig and router in order to cut a 5-inch circle. 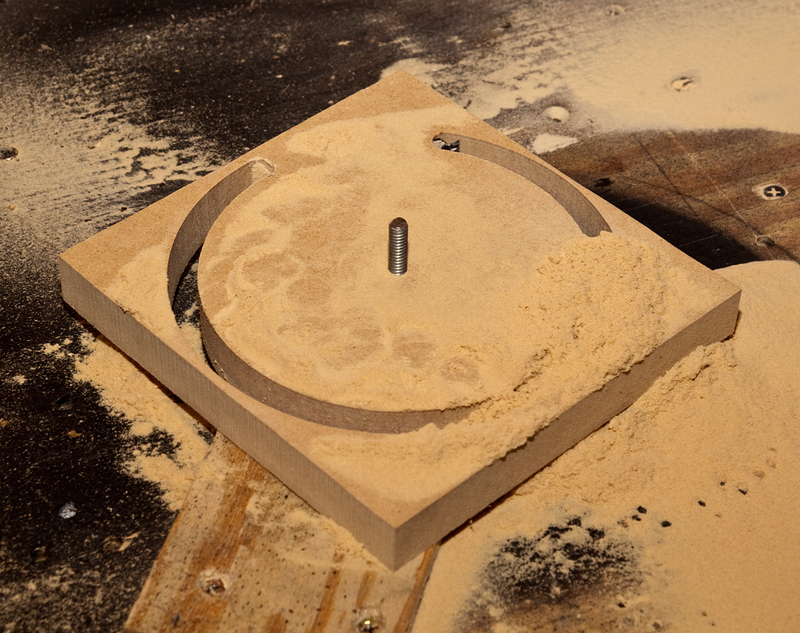 Cutting the circle: MDF produces lots of fine dust. Wear a mask! One flat, smooth-edged circle; one more to go! 3. Making the groove: Jared made his spacer primarily to allow him to hang a weight from his G-11 to keep the RA worm against the worm wheel for good tracking. He made a groove in his spacer, as a guide for the weight’s string. I might want to do this someday, so I made a groove in my spacer, too. Jared used a bit on his router; I used my palm sander. MDF sands easily, so be careful if you do this, too. I just held the sander at an angle as I slowly spun, in my other hand, one edge of each ¾-inch thick circle. 4. Gluing: I used yellow wood glue. With my bare fingers, I spread a very thin layer over the surface of each circle (making sure to have the grooved edges facing inward), let it set for a couple of minutes, then put a bit more glue on one circle, stuck the two together, and clamped them. I find that this method gets the pieces stuck tightly much more quickly. Circles glued and clamped. Notice the burnt center hole. Notice also the RA axis plate on the Dec shaft. 5. Matching the holes: I removed the plate from the mount and taped it carefully and tightly to the spacer with painter’s tape. I then used my drill press to drill ¼ -inch holes directly through the holes in the plate. It’s important to go slowly through MDF, backing out of the holes often to remove the loose dust caused by the drilling. Otherwise, the bit can knock out a divot from the surface on the bottom. 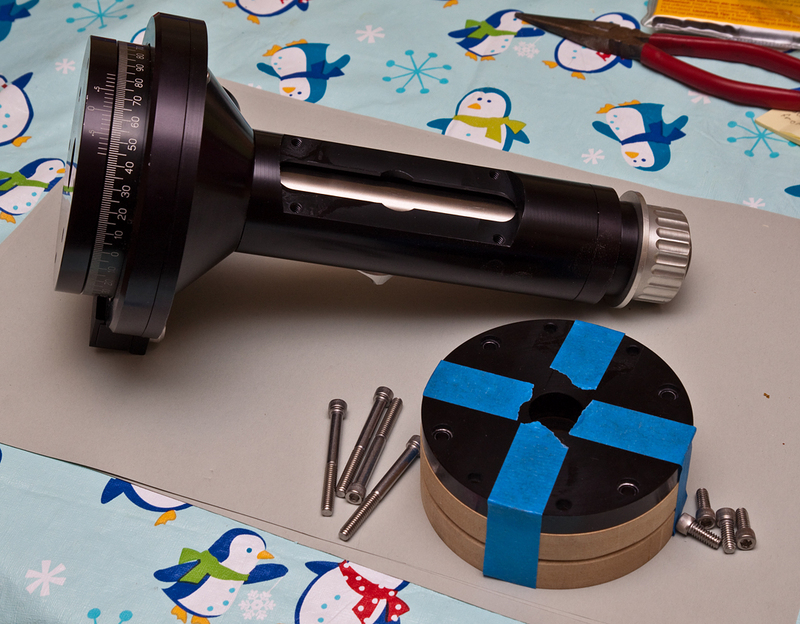 The RA plate is now taped to the circles as a guide for drilling the mounting holes. Notice the short (old) bolts and the longer replacement bolts. 6. 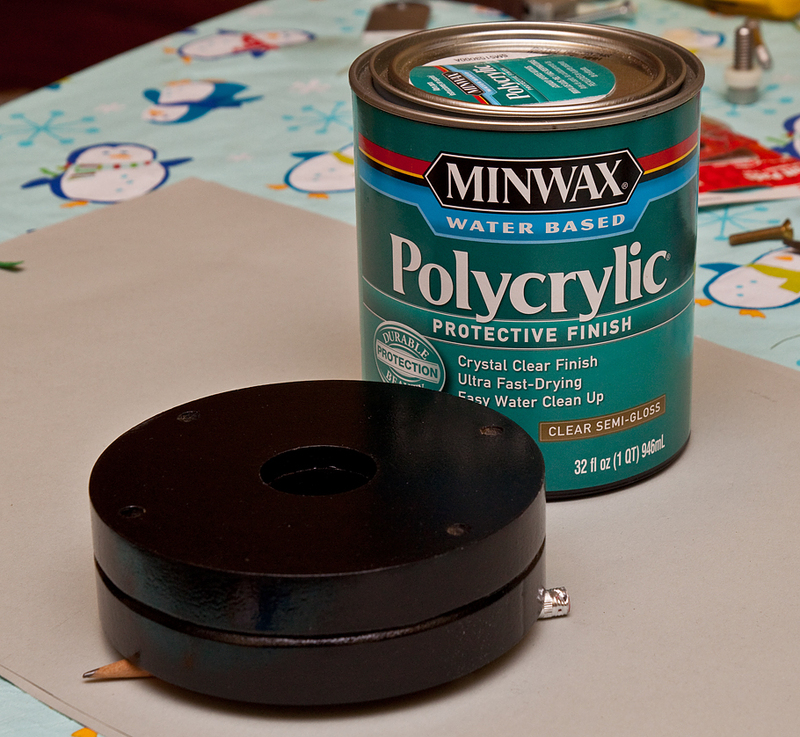 Paint and finish: There are probably lots of ways to do this, but I used what I had: three or four coats of satin black spray paint, which I let dry for a few days, just in case. Then, since the paint sealed the MDF, three coats of water-based polyurethane. 7. Assembly: Because the holes in both plates have to match precisely, and the holes through the MDF were exactly the diameter of the bolts, it took a bit of doing to get things to match up for screwing it together. But the tightness of assembly assures me that everything is as it should be. Spacer installed! Arrows mark its location. 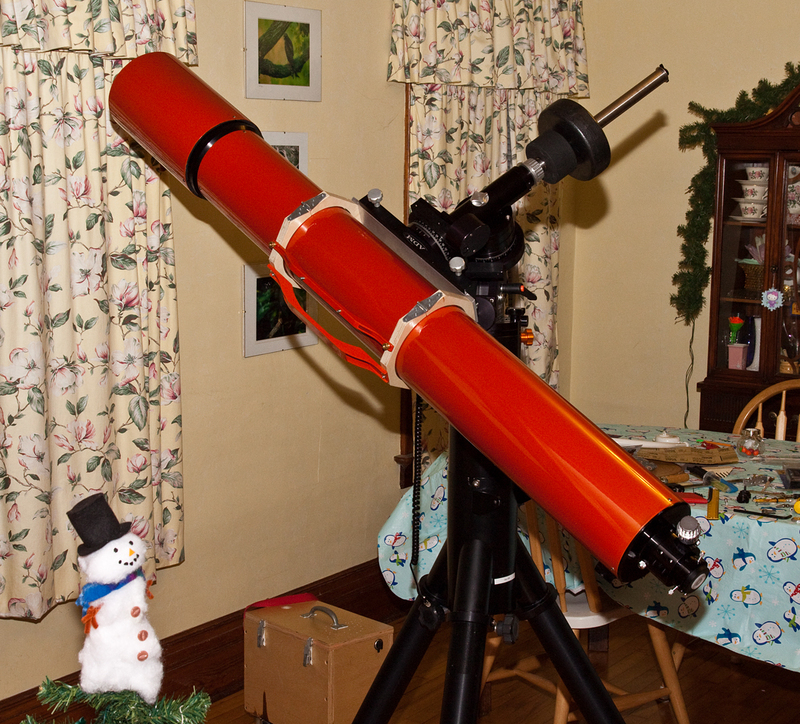 I just finished this last night, and have not yet tested it under the stars (it’s windy, cloudy, and very cold here in Wisconsin right now). But I don’t see why it won’t work just fine.